In Georgia, it’s easy to have so much food on a table that there’s nowhere to set anything down. Enter Lobiani – the hand-held filled pastry that combines the best of two of the country’s best dishes. 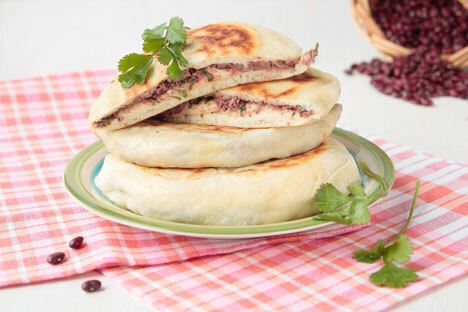 A typical Georgian feast can include chashushuli (beef or veal stew with spices); pork, beef, chicken or fish kebabs; eggplant rolls with walnuts; tomato-&-cucumber salad with coriander and walnuts; pkhali (beetroot or spinach balls) and two obligatory dishes – khachapuri, the cheese-filled pastry also known as the food most likely to ruin your diet; and lobio, beans slow-cooked with herbs and spices. Then there is lobiani, which is a combination of the two. 2. For the dough, warm the yogurt (or kefir or sour cream), add the yeast, sugar and salt. Leave for 10 minutes to let the yeast activate, then add the egg and mix well.